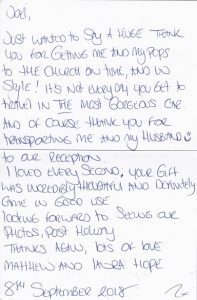 We would like to thank you for all your help on the wedding day, we were extremely pleased with Audrey and the very professional service we received. The gift for us left in the car was a very special and lovely touch along with the champagne! 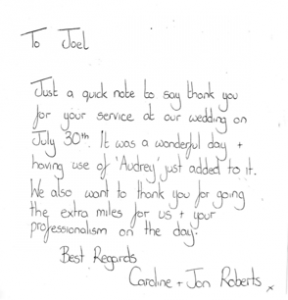 We would highly recommend any one to hire Audrey in the future. Below is a link to Brides up North website that ran a feature on our wedding. We mentioned Ivory Vintage Wedding Hire in the article and there are a couple of pictures of Audrey. 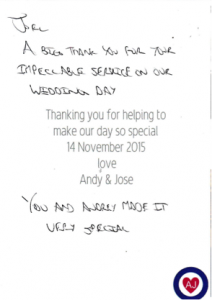 Just a message to say a 'belated' but massive thank you for being part of our special day!! Myself and simon got married 05/09/14 and had the most perfect day made even better with Audrey taking pride of place! We have some amazing memories and photos to cherish! 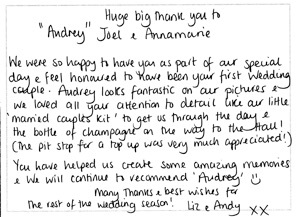 Your professionalism and patience were much appreciated and our little drive as the new Mr and Mrs Daley was fabulous! !